Sravasti Abbey’s Sharing the Dharma Day is the focus if this excellent video. It’s created by our friends at the Spokane Interfaith Council as part of their Meet the Neighbors program. Meet the Neighbors began in 2015 to build connection and understanding among the Spokane region’s cultural and religious groups. Meet the Neighbors organizes on-site visits so people can learn about the wonderful variety of temples, churches, and mosques in our community. Site visits include a short presentation from members of that faith tradition. Guests are encouraged to ask questions about the group’s beliefs and practices. The Interfaith Council also produces short videos explaining what to expect when visiting a particular place of worship. The Abbey’s Meet the Neighbors event took place last June. Christians, Muslims, and other Buddhists attended. Some of the guests came from Iraq, Pakistan, and Ethiopia. After introducing the Abbey’s purpose and practices, the conversation turned to the importance of interfaith cooperation in our world. As a group, we voiced a strong intention to support interfaith understanding. We were united in wishing to override the voices of division in the US and the world. This seems even more urgent today than when we met last summer. 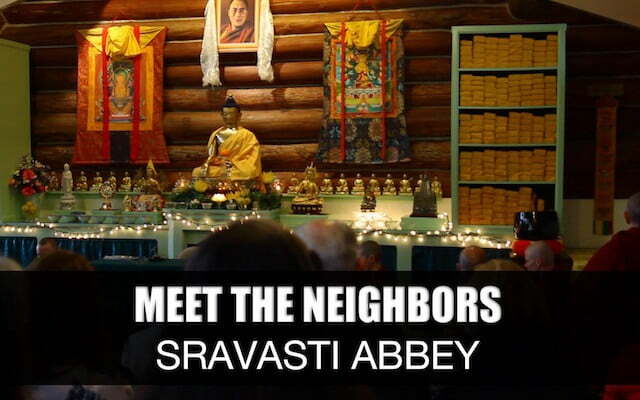 The video below introduces the Abbey’s Sharing the Dharma Day. With the kind permission of Spokane Interfaith Council and their partner, SpokaneFAVS, we’ll have the video link on every Sharing the Dharma Day calendar page. This will support newcomers to our monthly “open house” event. See the Event Schedule for the next one.